This article is a short summary of Donkey Kong (slot machine). Donkey Kong is a slot machine for arcades, based on the Donkey Kong series, and with artwork based on the Donkey Kong Country sub-series. 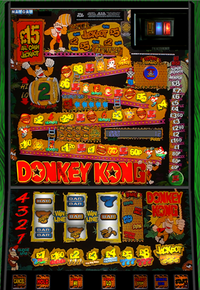 The game appears to work as a traditional slot machine, but is branded after Donkey Kong. It was one of multiple arcade machines Maygay produced, based on multiple game and media franchises like Pac-Man, Tomb Raider, Mario, Tetris and lesser known ones such as Mr Do!.